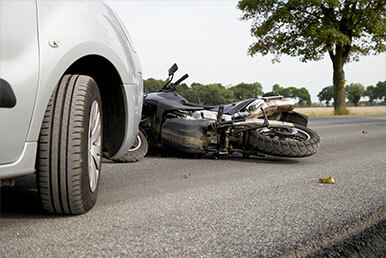 Motorcycle riders are at a significant disadvantage when involved in an accident with a car, truck, or bus. The size of a motorcycle makes it more difficult to see in traffic and cars, trucks and buses may not be looking for you. Motorcycles are also less stable than cars since they have two wheels instead of four. When you have to make evasive maneuvers avoiding a careless car driver, you are at a greater risk for personal injuries than other motorists. The only protection you have is your helmet and the gear you are wearing. Unlike cars, there are no airbags, seat belts, or solid steel frame to protect you in a motorcycle accident. As a result, you are vulnerable to any number of personal injuries such as severe spinal injury, burns, broken bones, brain damage. Our firm’s founder, Richard Noll, is a motorcycle rider who understands the intricacies of motorcycle operation and the safety concerns particular to riding a motorcycle. Injured in a Motorcycle Accident on Long Island or in New York City? If you or a loved one has suffered a personal injury in a motorcycle accident and another person’s negligence is to blame, you should contact The Noll Law Firm, P.C. to pursue your claim for personal injury. We travel to any Long Island or New York City location at whatever time is convenient for you. You are encouraged to call us at any time. Our clients receive immediate, personalized service from one of our attorneys who will then diligently prosecute your case. Our aggressive approach to personal injury case development results in faster resolutions, without sacrificing quality, in a court system that can be frustratingly slow. We believe this is especially important to motorcycle accident victims who need the money from the lawsuit to help pay for medical bills, lost earnings and all the other financial hardships associated with their motorcycle accident. The New York, Long Island Personal Injury Lawyers at The Noll Law Firm, P.C. provide legal services to clients throughout NYC and Long Island with Personal Injury and motorcycle accident legal needs. Our dedicated attorneys are available to guide you through you legal matter and recover damages in order to avoid the financial burden of future medical bills and possible lost wages. The firm prides itself on the personalized attention it offers clients. The firm is dedicated to seeking justice for other’s negligence. If you need representation for a personal injury claim arising out of a motorcycle accident on Long Island, Manhattan/New York County, Staten Island, Queens, Brooklyn/Nassau County/Long Island, Westchester County, Rockland County, or Harlem, New York, contact The Noll Law Firm, P.C. now at (516) 252-1728 for a free consultation. How do I pay my medical bills in a motorcycle accident? What happens when a motorcycle accident occurs?